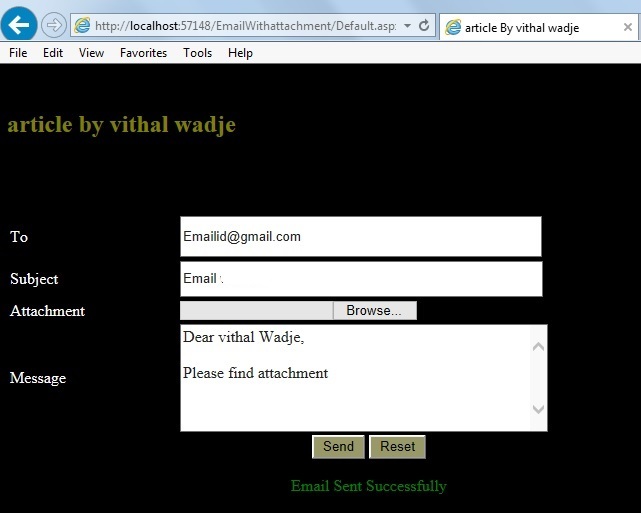 In this article we will learn how to send emails with attachment from an ASP.Net C# web application. Let us see step-by-step so beginners also can understand the logic to send emails from any provider. Their are many techniques to send emails from ASP.Net with with attachment but in this article we will use a SMTP server with the Gmail provider to send the emails. Download Aspose : API TO Create and Convert Files . "Start" - "All Programs" - "Microsoft Visual Studio 2010". "File" - "New Project" - "C#" - "Empty web site" (to avoid adding a master page). Provide the project a name, such as "Sending Emails with file" or another as you wish and specify the location. Then right-click on Solution Explorer and select "Add New Item" - "Default.aspx" page and one class file. Drag and drop three Text Boxes and two buttons and one file upload control to attach files. To learn about the two namespaces above refer to the MSDN. In the preceding app settings section, we are adding the sender email details credentials such as email id and word, so we can send the emails and later on we will read these values in the .cs file. In the preceding app Settings section add your valid email and word so emails can be sent from your email id to others. From the preceding example we learned how to send emails with attachment, I hope you have done it. Don't forget to update the "Web.config" file for your email credential details. 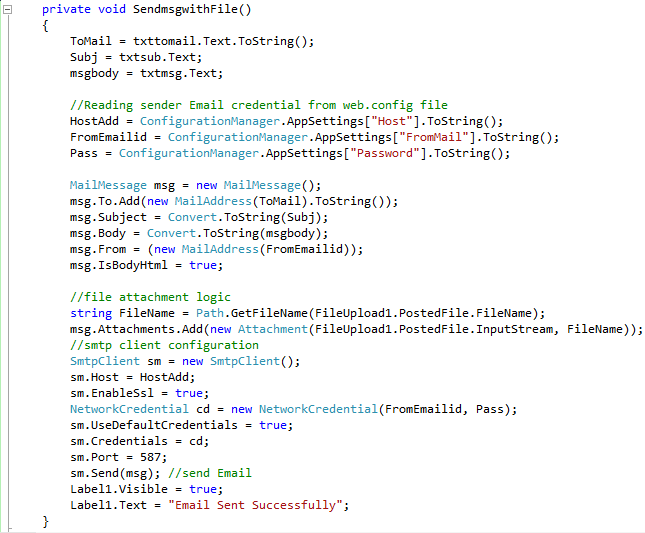 We learned how to send emails in ASP.Net with attachment. I hope this article is useful for all students and beginners. If you have any suggestion related to this article then please contact me.